See the best of the Big Island by air and land, with this complete tour package that includes two helicopter flights and a guided sightseeing tour. See Kilauea Volcano, Waterfalls, Punaluu Black Sand Beach & more! See the Big Island up close and get a bird's eye view as well on this comprehensive land and air adventure. Take a helicopter flight from Kona and see landscapes across the Kona coffee district, go on a volcano tour of the three mountains Hual?lai, Mauna Kea and Mauna Loa, and get a bird's eye view of the active lava flows of Kilauea. After landing in Hilo, expert guides will take you on a land tour to all of the best locations in the Hawaii Volcanoes National Park, as well as the black sand beaches. Then you'll be able to go on another helicopter ride back to Kona along the waterfalls and cliffs of the island's beautiful east and north coasts. Luxurious – Executive Limousine Style Seating! One passenger in the front with the pilot and five in the back. 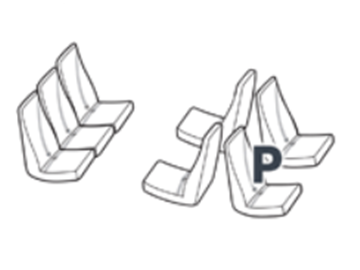 Two seats face the other 3 seats allowing you to see and talk to the person(s) you are flying with. Viewing is great from all of the seats. Note: Due to the volatile nature of the volcano, seeing active lava flows can never be guaranteed on Big Island tours. These helicopter rides around the Big Island come with a land tour of Hawaii Volcanoes National Park, allowing you to see the volcano and flowing lava from the ground and the sky, all in a single, full-day tour! Get birds-eye views of four volcanoes: Hualalai, Mauna Kea, Mauna Loa & Kilauea. This helicopter lava tour lets you hunt for active lava flows from up in the air over Kilauea and the East Rift Zone. Experience unique photo opportunities at the famous Black Sand Beach on the Big Island's south shore! Turtles often rest on the Punaluu Beach's black sand or nearby rocks. The fertile soil of the Big Island's volcanic slopes is great for growing a variety of local produce. Sample some and shop for award-winning fresh coffee as well as locally grown macadamia nuts, honey, and chocolate at Kau Coffee Mill. Discover breathtaking views of Kilauea and the Kau coast and catch a glimpse of the Halemaumau Crater from a private viewing point on the side of Mauna Loa. View Rainbow falls from our private gazebo and tour a local farm, sample and shop for Hawaii Island grown treats like coffee, macadamia nuts, honey and chocolate. Venture into valleys with cascading waterfalls and see the beauty of Hamakua Coast on a second, afternoon helicopter flight back to Kona airport that takes you over the northern, scenic route around the Big Island. Sit right up next to the window and ensure you don't miss any of the amazing views! Note: Guaranteed window seating is already included in the capacity surcharge for passengers over 265lbs. Share the cockpit with the pilot, giving you maximum visibility from the front and side windows. Also great for aviation enthusiasts interested in getting a look at the helicopter's controls. All guests weighing between 265lbs (120kg) and 315lbs (142kg) will be assessed a Capacity Surcharge (CS). This fee is already reflected in the pricing section. Guests will be guaranteed a window seat. All guests weighing between 316lbs (143kg) and above will be assessed a Capacity Surcharge of extra seat. This fee is already reflected in the pricing section. Guests will be guaranteed a window seat. In compliance with Federal Aviation Administration (FAA) regulation, Paradise Helicopters will weigh each individual when checking in at the Airport for safety and weight balance of the aircraft. Please provide accurate body weights for all passengers. Misrepresentation of body weight could result in denial of service without refund. Guests must be able to walk over uneven terrain and short climbs. Wear whatever is comfortable for you. If you are going to take pictures, darker colors are better because it reduces the chance of reflections in your photos. Please call the activity provider the day before your activity (no later than 18:00 local time) to reconfirm your booking. Your voucher has the necessary contact information listed. Children under the age of two (2) fly free when seated in the lap of a paying adult. Proof of age is required for lap children under two (2). Children two(2) years old and over require an individual full-fare seat. In the event that your pilot needs to cancel for safety due to weather, your flight will be rescheduled. If a reschedule is not possible, you will receive a full refund. Tour length is subject to change. If you are prone to motion sickness, take motion sickness preventatives before you fly. Do I need to provide our exacts weights even if we don't exceed the weight limits? Yes, the aircraft must be balanced in order to take flight. 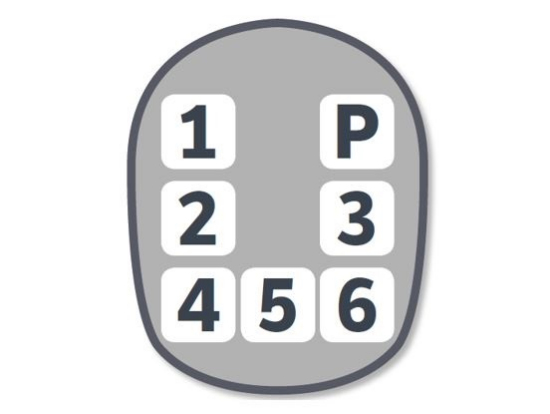 Providing incorrect weights can cause complications during check-in. What kind of helicopter will be used? 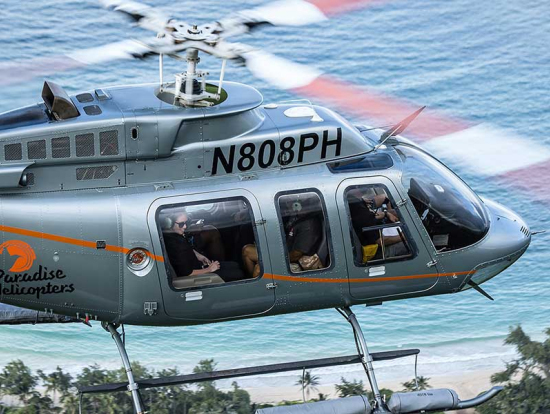 The Bell Jet 407 is a 6-passenger aircraft and it has the fastest cruise speed of any helicopter on the islands and offers unsurpassed comfort and a virtually vibration-free ride. Its oversized sliding windows offer great picture taking views and it is capable of flying non-stop around the entire Big Island, giving you as much time in the air as time permits. This adventure is one-of-a-kind! We did this on our first day of our honeymoon and we were not disappointed. Highly recommend this to others!